Long-running furry webcomic Kevin and Kell has survived a cull of comic strips from The Atlanta Journal-Constitution. A few days ago, the newspaper decided to get rid of 11 of its 36 comic strips. An online poll was held to decide which of the comics should stay and which should go. In the end, Kevin and Kell received by the far the most votes and stays. On the Kevin and Kell homepage, creator Bill Holbrook said: "Words cannot express my gratitude for your votes in the paper’s poll. The strip has always relied on its readers to continue, never more so than in this case. This victory is entirely your own." Holbrook added: "In the end this was an example of the power of the online world’s ability for people to come together and create a community. Again, I thank each and every one of you out there." Printed and published daily since 1995, Kevin and Kell is one of the longest running webcomic in the world, let alone the furry fandom. It focuses on the lives of the Dewclaw family and in particular parents Kevin and Kell, who are in a mixed marriage. Instead of race though, the mix is in terms of diet – Kevin being an herbivorous rabbit and Kell a carnivorous wolf. The comic has been published online for what will be its 14th year in 2009. It has published in print in The Atlanta Journal-Constitution since January 2004 following a competition. Holbrook claims most of his readership comes from the paper. Not only does Holbrook write and draw the whole of Kevin and Kell, but he does another two comic strips at the same time: Safe Havens and On the Fastrack. 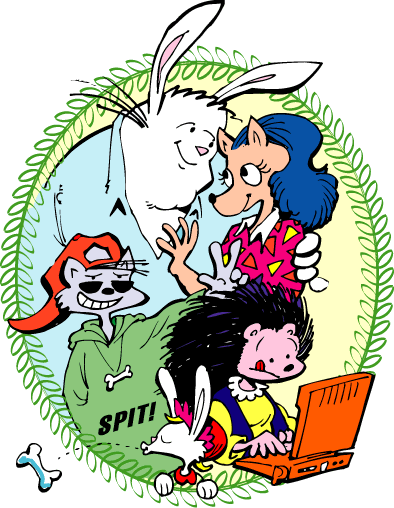 Kevin and Kell won the Ursa Major Award for "Best Anthropomorphic Comic Strip" in 2003, as well as several other awards.